I hate to release a trout I think won’t survive. 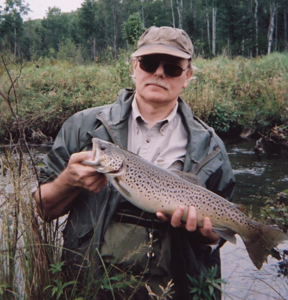 In Michigan there are minimum size limits for various trout species and it seems like the aggressive undersize trout are the ones most likely to perish from unhooking and handling. Unfortunately, if you are caught with an undersize trout you could face a fine – maybe even lose your license. So there is the dilemma – let the trout go when you know he may die or take it home to eat and risk a fine. This may be a case where a little common sense may improve the law – allow a single undersize fish in the creel. Trust the angler to make a judgment call about the condition of the fish. Larger fish are usually pretty tough. I have caught trout with a patch over one eye and their left pectoral fin tied behind their back, so survival rate is pretty good after they hit about fifteen inches. It is the duty of these experienced fish to teach the young ones about the various lures and how to recognize a treble hook, but I suspect the tough economy has had a trickle down effect so and more and more little trout have to fend for themselves without the sage advice of their elders. The scary hook jawed trout wearing eye patches may offer advice at the stream corner but if little trout are like little people, their mommas told them not to talk to strangers. From what I have seen there are no shortage of little trout – at least on the streams I fish. That may have a lot to do with the good management of the resource, or, more likely, on the ability of nature to replenish itself in spite of man. I fished a steam about fifteen years back that crossed a major highway straddled by farm country. 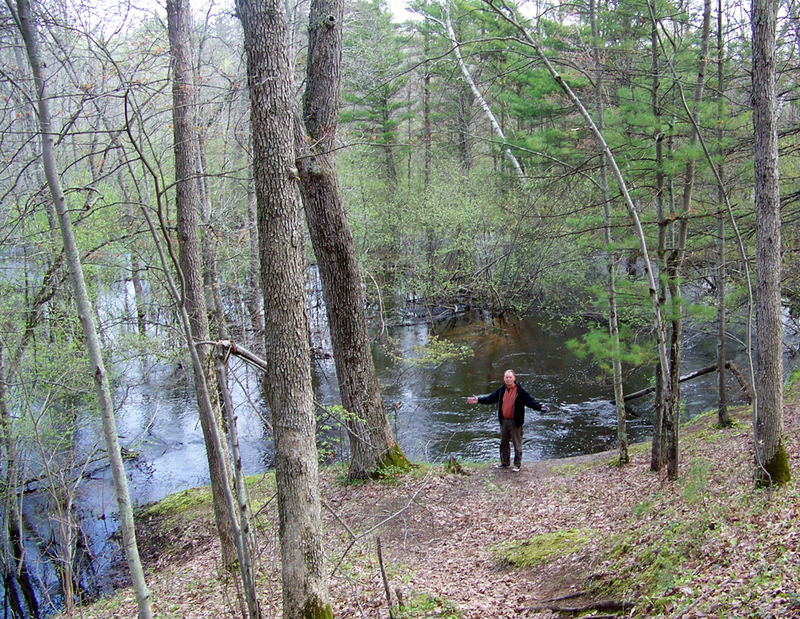 It was small, maybe ten to twelve feet wide with some mix of bottom including gravel and some very sandy stretches. When I stepped on the sand, bubbles of gas came up that stunk like nothing I can describe. I suspect it had something to do with chemical run off from farm land. 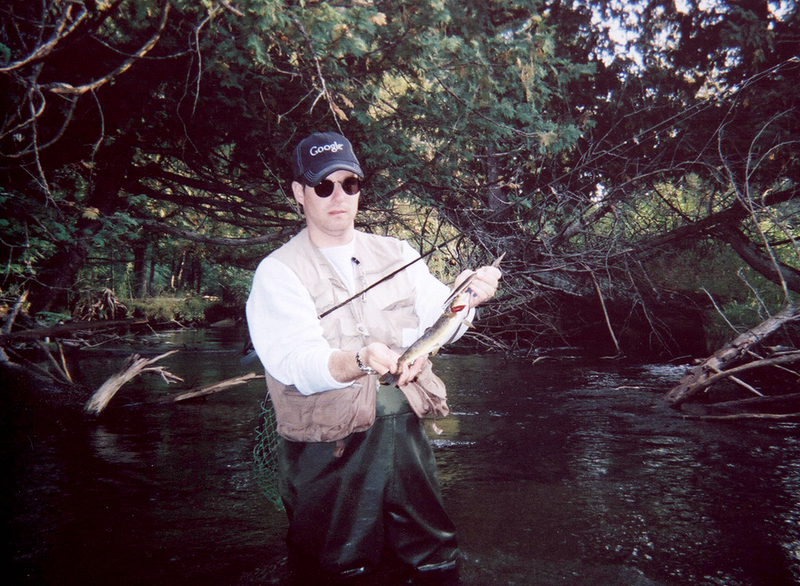 I kept fishing and caught a few small trout but sure didn’t keep any. After about an hour I came to a sharp bend and at the head of the bend the water was channeled through a tight spot. I tossed my lure in the backwater of the tight spot and saw the largest brown trout I’d ever seen on a small stream. He made a wake going for my lure then ducked into the deep hole in the bend. I went back once or twice hoping to see that fish again. I suspect that massive trout had a couple good stories and with the help of chemicals may have spoken proper English but I never got the chance to interview him. Back to small trout badly hooked, and some clarification: Depending on the stream, I’d like the option to cook up the ones I think won’t make it. If they speak English and ask to be put back I’ll honor their wishes. Denny is a trout camp regular and even more important a family friend. Strangely he has been best friends with myself and both of my brothers at different points in our lives. He is a character, with character, and to me the fact that he’s stayed connected says something very nice about our family. There is a quiet strength about him that may be hidden to some people by his outgoing personality and wit, but knowing him has made a difference in our lives. Sounds like a Eulogy in progress, but he’s fine, though he did have a scare and some surgery a short while back. 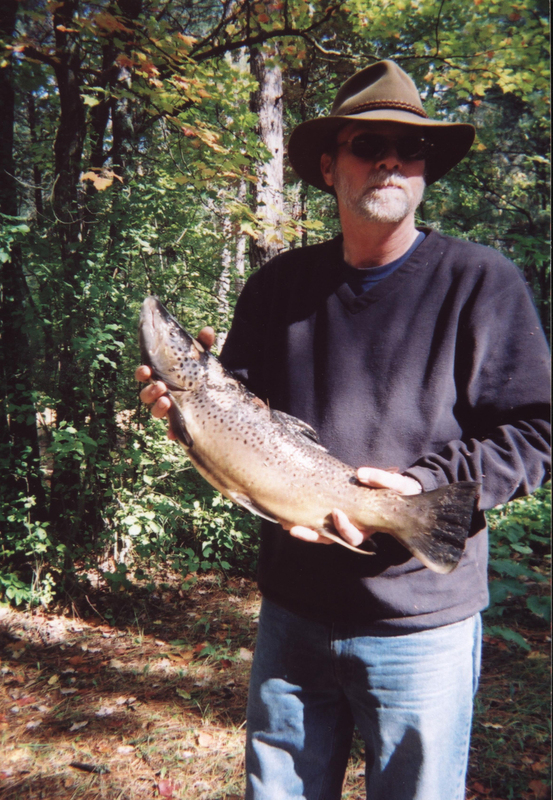 The photo above was taken a few years ago at fall trout camp. Feral and I had an ongoing, unspoken contest with Mike and Denny regarding the largest trout and we were taken back when Denny pulled this one out of his cooler. We don’t necessarily keep the fish, we use the honor system and keep a tape or de-liar on us when we go out, but Denny happened to keep the one shown here, a two-footer. He caught it on the Sturgeon casting from the bank because the river was too high and muddy to wade. It is difficult to present just how difficult a task it is to pull a fish like that out of the Sturgeon – even in the best stream conditions. To do it from the bank is next to impossible. So there you go, Denny is a trout fisherman and certainly has earned a seat at trout camp, not to mention a spot at the family table. 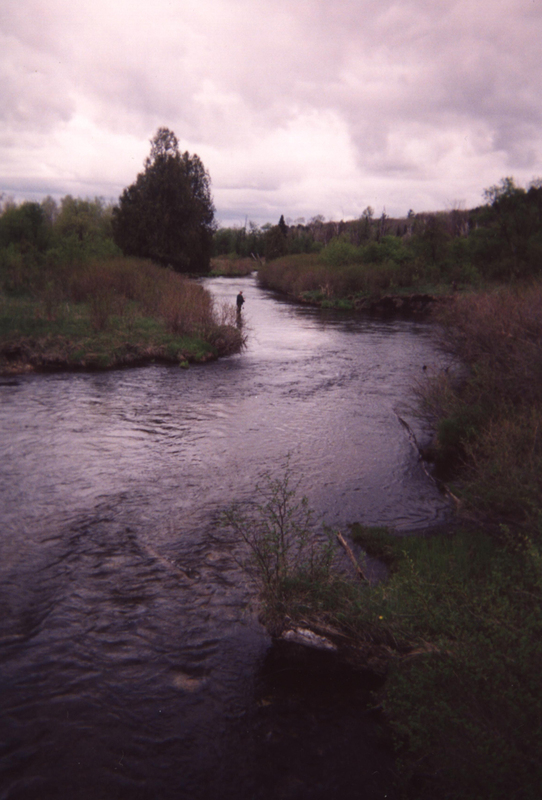 On one of our favorite streams, the Sturgeon, there is a very wide gravelly bend where the water level drops down to a foot deep that gives us a chance to relax a bit, mainly because the straight stretch leading to it is log filled and treacherous, and just above the bend the water is channeled so thin it can’t be waded because the water is over the waders. There is an old homestead on the outside bank, with only the footing remaining, along with the white shell of an old refrigerator. I am trying to remember if the fridge is still there or if I have become so numb to it that it doesn’t register any more. It could be someone dragged it away and I’ll thank whoever did it, even though we may need a new name for that spot in the river. Wide flats like that one are pretty unusual in the Sturgeon – it may be forty feet across. The outside has some log structure and I normally pass right by it without making a cast even though the structure likely holds trout. In my mind, it’s a great spot for fly fishermen since it is so open, but not necessarily a good spot to find the larger trout I’m after. If it’s raining I can’t wait to pass by it just to get to the deep channel upstream where I’ve seen trout in the two foot class. That’s Feral in the picture, taken back in 05. I suspect it wasn’t much of a fishing day with the blue sky. There’s a good chance we had a cold beer with us and that would have been the place we stopped. I can almost feel the cool breeze from the river, maybe even fooling us into thinking the sun was not a problem, only to notice sunburned ears later. I’d like to make that same trip again this year whatever the weather, if only because the Sturgeon offers such a great variety of holes, flats, deep bends and places where you just know a trophy brown will rise up and surprise you. Four men in a boat, one wired. Two flies land on a pile of dung and after a minute or so one farts. The other looks over and says, “Do you mind? I’m eating.” That jewel came from Natch, our wired fishing buddy. He pulled out his internet phone after hearing one of us tell a groaner. 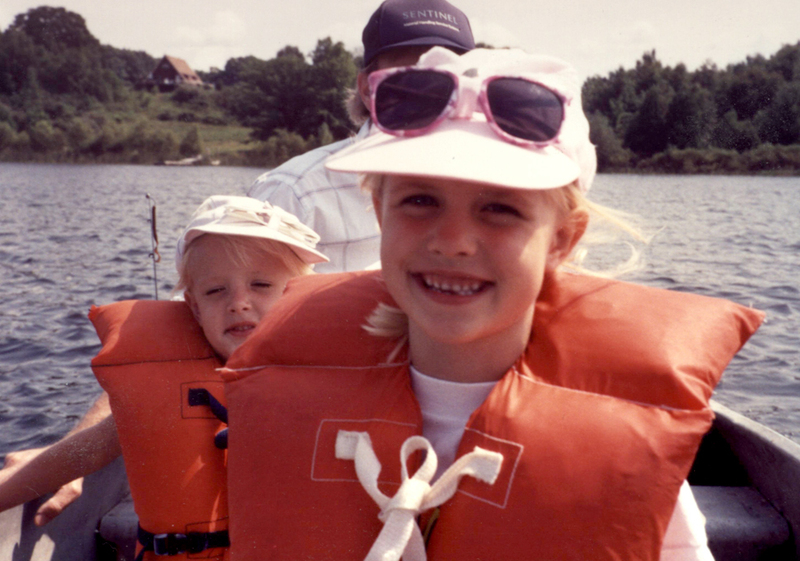 We were trying to pass the time on a lake and it looked like we might revisit the catalog of jokes we have been repeating for twenty years. 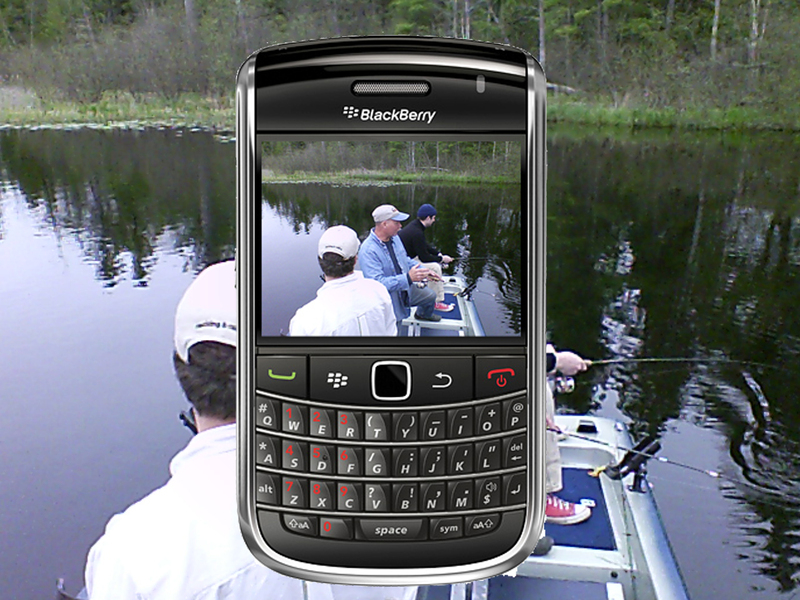 It’s amazing how useful it is being connected, especially when four guys are sharing a boat built for two and fishing a lake that appears to be poisoned off. I don’t know if Natch placed any orders for tech stocks while we were whizzing treble hooks by his scalp, or whether he managed to call Rene and the boys, or if he checked his email to see how missed he was at work, but I can say for sure he was less bored and frustrated than those of us casting for the missing fish. I sidetracked a bit. I was in a high rise office building this spring knocking on doors trying to drum up business. I stepped into an elevator and a small group of professional thirty-somethings jumped in at the last second. As soon as the door closed the smart phones came out and they all started checking for messages. Snotgold had to upgrade his nickname at the first annual trout camp treasure hunters competition and jamboree at an unknown campground last week. Typically metal detector treasure hunters bring in a haul of bottle caps, spent cartridges, sinkers, a few pennies and maybe a nickel or quarter if the hunting is good. The competition had few rules other than each team had to have a top grade detector and a shovel, they had to refill any dug holes so they were not noticeable, and they had one hour to bring back the most valuable haul. Not since the Monitor and Merrimack have two teams sought metal with such passion. I teamed with Snotgold and right off it looked bad for us while we watched Ironclad and Natch dig up a quarter in the first five minutes. Snotgold was nonplussed and just dialed his detector down to “don’t ding unless it really might be something good.” High tech metal detectors have a variety of settings like that whereby the sonar can detect a shape and save the hunter countless hours. 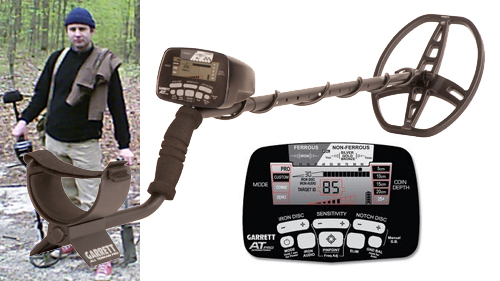 For instance, if he needs a ¼-20 hex head bolt to put a muffler back on his monster truck – there is no need to go to the hardware store, just fire up the detector. The clock was winding down for us and we could see Ironclad and Natch working over a remote campsite used by backpackers. With their 25 cent jump on us it was getting a bit tense as Snotgold brainstormed some general thoughts on where real treasure might be dropped – mainly where is the heavy foot traffic and how might someone drop something of value. He keyed in on an old well and finally on a billboard that showed the latest DNR messages about the new campsite fee for state forest campgrounds. With the fee now reduced to $13 a night it made sense that people would be digging for pocket change trying to come up with that odd thirteenth dollar. After a couple adjustments to the detector he made a quick sweep and we heard the telltale ding. Snotgold reached down and grabbed something lying on the ground. He held out his hand and opened his fist to reveal a flattened gold ring with tiny diamonds. At first I was concerned it was costume jewelry but he assured me: Tisgold. We had a short but interesting trout camp this spring made even more so by the flooded rivers. Not a typical high water mark – actual flooding. The city of Baldwin made calls to city residents to warn them. Small town goodwill! After setting up camp Feral and I went out to inspect the local streams. 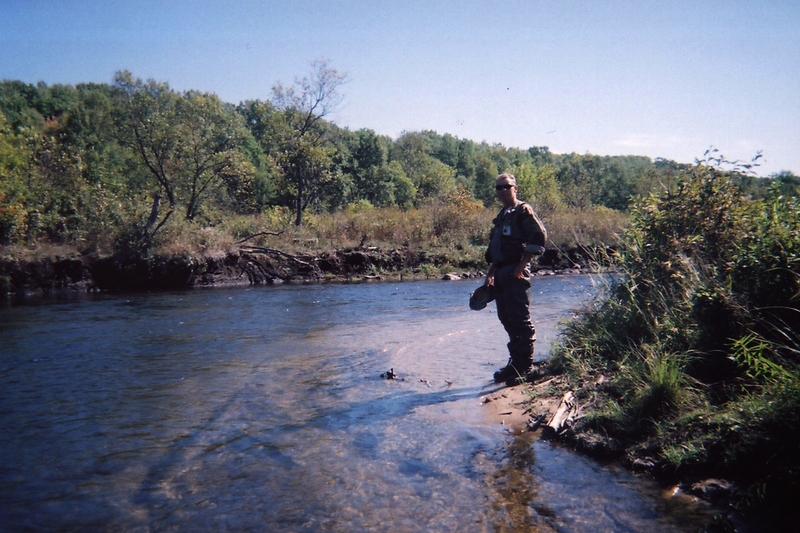 The Baldwin River, one of Michigan’s great trout streams, is a tributary to the Pere Marquette. It usually runs one to three feet deep with scattered holes that might go above the waders. Since we knew it was flooded we went upstream where the river is typically brush congested and tiny – five or six feet across and a foot deep. We thought we might be able to get in and wade. There is an access point on Foreman Road east of town that Feral sometimes fishes so we pulled in there first. It was so flooded we couldn’t see where the normal river channel flowed. We drove north on Foreman Road a little further and saw some guys at the bridge where the Baldwin crosses and pulled over just in time to see one guy running for his truck to get a net. We managed to get pictures of them landing a nice brown. They were pretty talkative and we got to know them a bit – Ron Walker and John Leitz, a couple retired guys that worked at the Fridgidaire Plant in Greenville. They had some good stories. 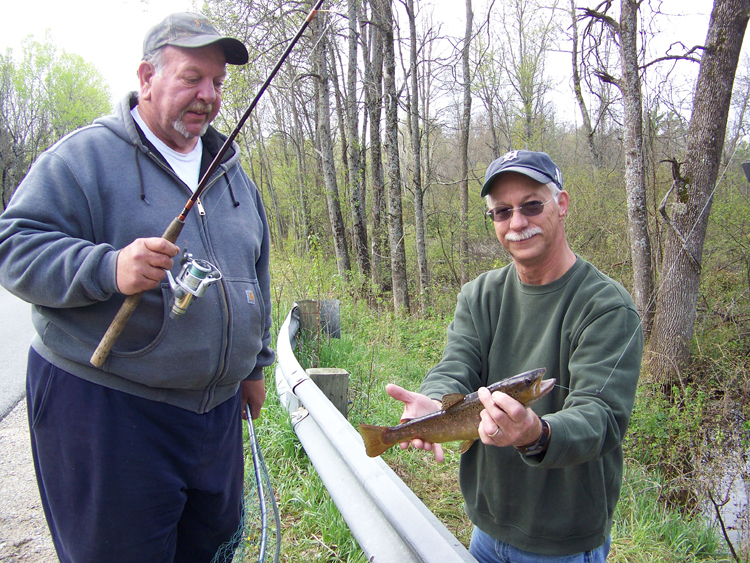 They travel all over Michigan fishing for any game fish you can name. I give them a lot of credit to doing whatever works including chunking crawlers off a bridge in a flood. I looked at their brown trout and my first thought was why does that fish look pregnant? Its belly was that distorted (though it’s hard to see in the photo). After they unhooked the trout it regurgitated a handful of night crawlers. 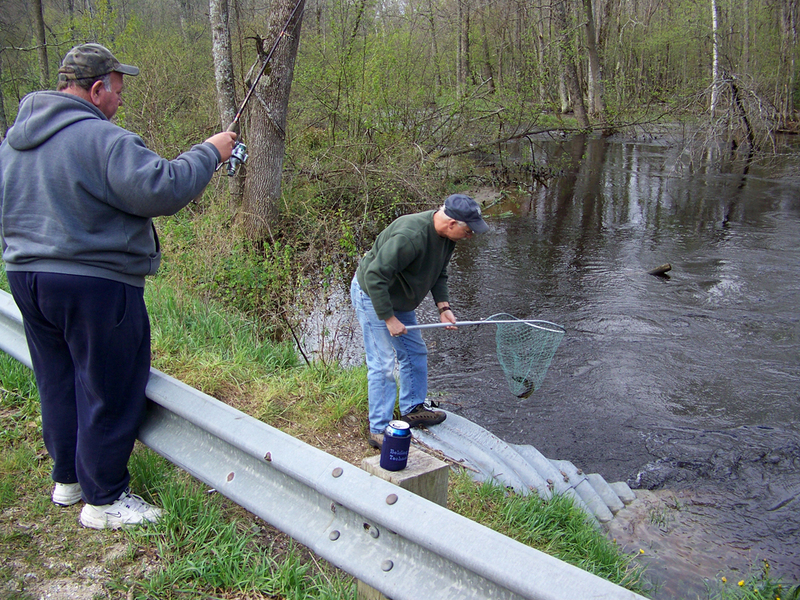 So if you wonder why it’s hard to get a trout interested in lures right after a good rain there was a graphic example. No room for dessert.